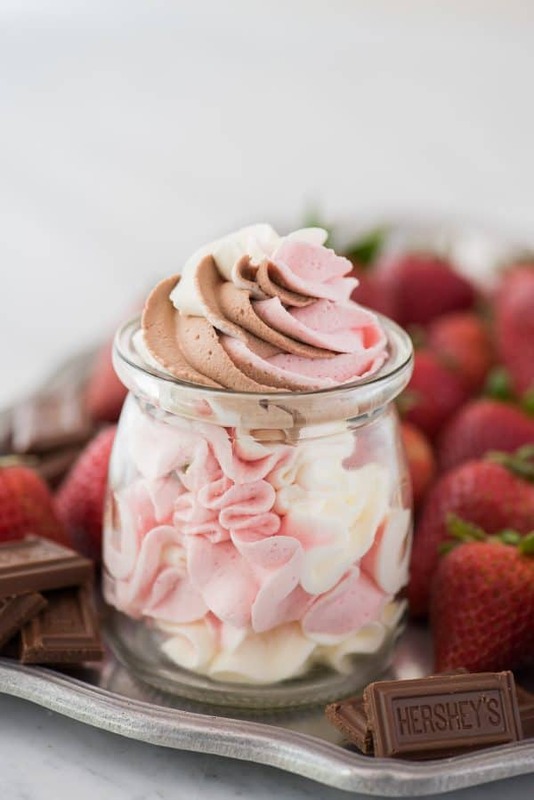 Homemade neapolitan whipped cream that can be used on cake, cupcakes, ice cream cake, pies, angel food cake, pudding, pancakes, fruit, etc! Before I made homemade whipped cream, I was definitely a cool whip girl. I thought it was the best. But now that I am older and wiser (LOL) I have a different opinion. However, I do still love the convenience of cool whip, especially when mixing it into a pie or when it’s being added to other ingredients. So I’m not 100% “a make homemade whipped cream all the time” kind of baker. 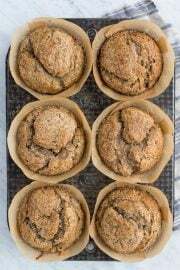 But it’s handy to have a homemade recipe for when you need it or for when you want to me a little extra fancy ???????? 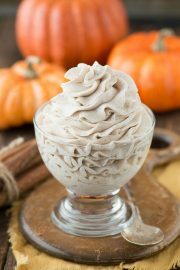 My love for homemade whipped cream all started with this chocolate whipped cream, which is so dreamy, I could eat it by the spoon like mousse. I mean, chocolate plus anything is a good idea. I was brainstorming recipe ideas and I seemed to be on this neapolitan kick. 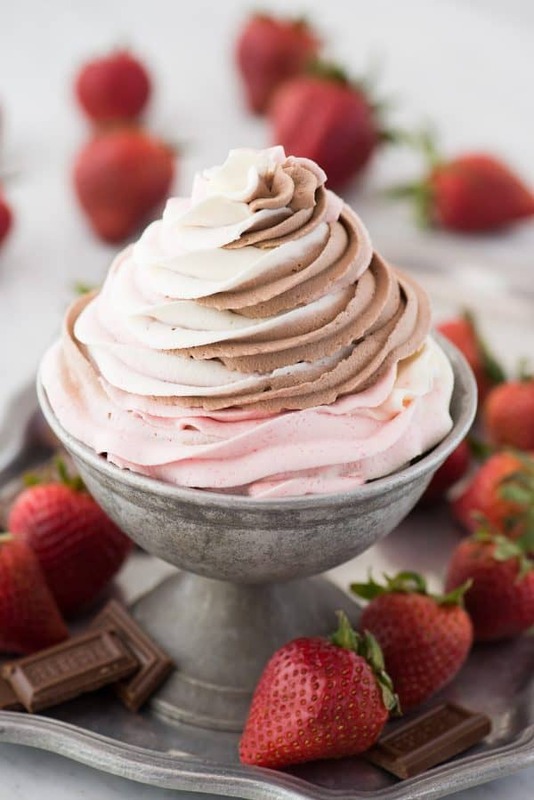 I haven’t made any neapolitan recipes in the recent years, but for some reason I couldn’t stop thinking about the combination of vanilla, chocolate & strawberry. When this idea for neapolitan whipped cream came me to I was like yeessss!!!! It sounded so good and I knew I needed to make it. 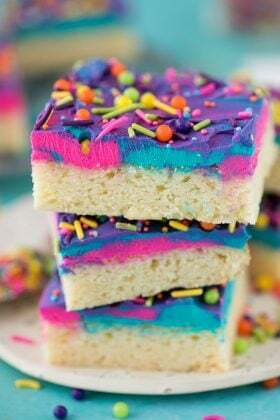 When you’re swirling anything together, be it buttercream or whipped cream, one of the keys to keep the swirls looking clean is to separate the colors into various piping bags. So the vanilla whipped cream went into one bag, the chocolate into another and the strawberry into a third. The trick for this is to then place the 3 piping bags into a larger piping bag that has your piping tip in it. See the video below for a quick overview. You COULD carefully put each flavor of whipped cream into one piping bag and hope for the best, but I didn’t want to risk my whipped cream all blending together and turning into poopy brown. How can you use this neapolitan whipped cream? On..
As frosting on cake, cupcakes, and ice cream cake. As a topping on pies, angel food cake, pudding, ice cream, pancakes, waffles, and french toast. As a filling for cookie sandwiches. As a dip for fruit. As a topping for warm drinks like hot cocoa. 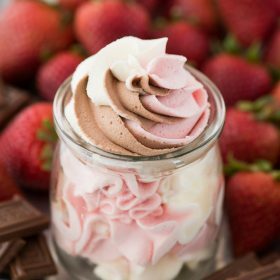 Homemade neapolitan whipped cream that can be used on cake, cupcakes, ice cream cake, pies, angel food cake, pudding, pancakes, fruit, etc! 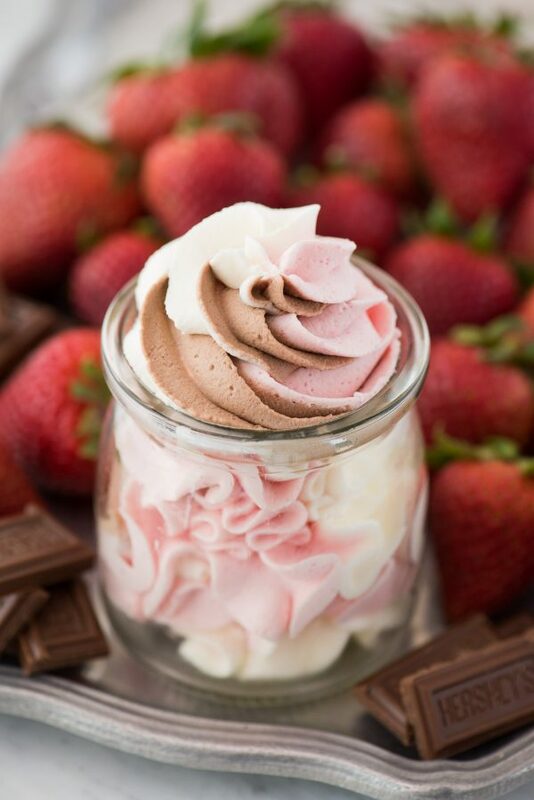 Vanilla whipped cream plus chocolate whipped cream plus strawberry whipped cream. Pro Tip: Place 3 metal (or glass) bowls in the freezer along with the beaters to chill for 15 minutes. Remove the bowl from the freezer. Add the heavy cream, powdered sugar, vanilla extract, and beat with an electric mixer for 4-5 minutes, or until stiff peaks form / it’s scoop-able with a spoon and holds its shape. Fill a 12 inch piping bag half full with the whipped cream. Twist the top of the bag and secure with a rubber band. 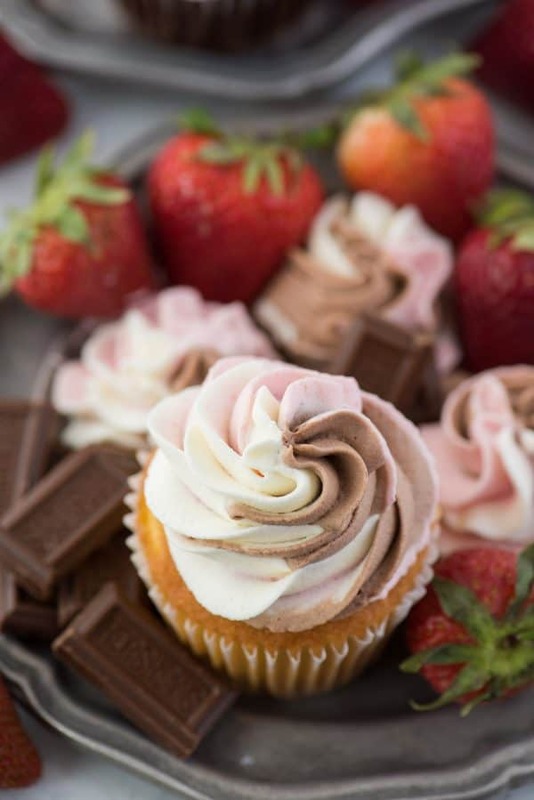 Place the piping bag and extra whipped cream still in the bowl in the fridge while you prepare the other flavors. Remove the bowl from the freezer. 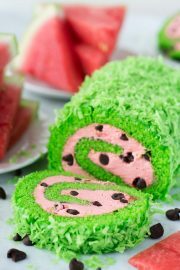 Add the heavy cream, powdered sugar, strawberry jello powder, and beat with an electric mixer for 4-5 minutes, or until stiff peaks form / it’s scoop-able with a spoon and holds its shape. Remove the bowl from the freezer. 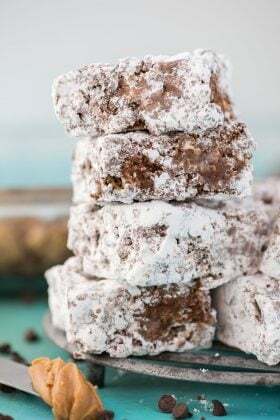 Add the heavy cream, powdered sugar, cocoa powder, and beat with an electric mixer for 4-5 minutes, or until stiff peaks form / it’s scoop-able with a spoon and holds its shape. Cut the tip off each piping bag, creating a hole that's about the size of an M&M. Place a metal piping tip (I used a Wilton 1M) inside a 16 inch or larger piping bag. Cut a hole for the tip. Place the 3 smaller piping bags inside the larger bag, pushing them towards the tip and putting pressure on the top of the bag to get the whipped cream to come out. Pipe whipped cream swirls or use however you'd like. Use whipped cream..As frosting on cake, cupcakes, and ice cream cake. As a topping on pies, angel food cake, pudding, ice cream, pancakes, waffles, and french toast. 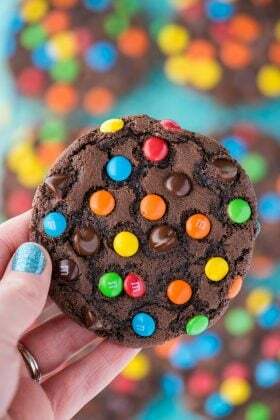 As a filling for cookie sandwiches. As a dip for fruit. As a topping for warm drinks like hot cocoa.